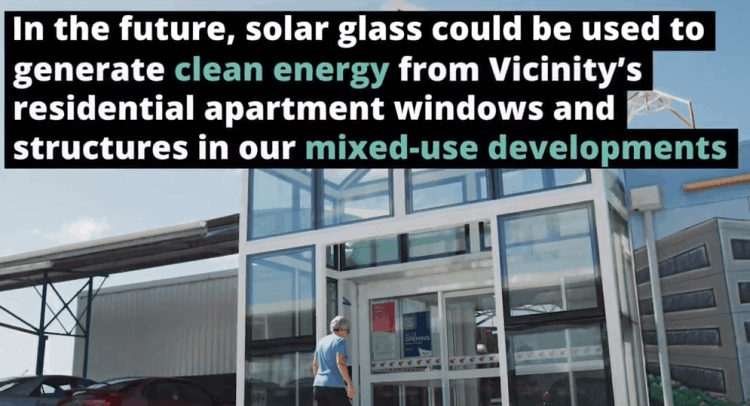 Solar glass shopping centre – Vicinity Centres/ClearVue. Australia’s largest retail landlord, Vicinity Centres, has partnered with innovative solar glass company ClearVue Technology to install transparent solar panels (solar glass) to help their shopping centre’s environmental footprint and potentially save money on energy. We’ve written about ClearVue Technology quite a few times on this website, from their solar bus shelters to commercial solar windows, the company have been working hard bringing their integrated clear glass solar panel to market in Australia and overseas. The company have now partnered with Vicinity Centres to install solar glass in its Warwick Grove shopping centre atrium entry. The solar glass atrium has 26 solar cells inbuilt, which generate up to 1MW. It also works as insulation – with materials inside the window deflecting energy to small PV cells at the edge of the screen. This solar window tech is something we’ve been very excited about for a long time so it it’s amazing to watch it enjoying some real world application! According to ClearVue, this is the first commercial installation of fully transparent solar cell glass in the entire world. The solar atrium will power lighting, outside signage, a digital display screen within the centre, and it’ll send any excess energy to battery storage at night. So it’s a pretty far cry from actually powering the shopping centre, but that’s not really the point right now. “While other products exist, these are typically optically distorted or coloured, or they are not yet commercially available and are still in the research and pre-commercialisation stages,” a ClearVue spokesman said in quotes to the Sydney Morning Herald. “(the solar atrium) reinvents the way we harvest renewable energy, reduces our exposure to the volatile energy market and our carbon footprint – a key focus for Vicinity. “We’re excited to be trialling such innovative, leading-edge technology and embarking on a global-first in solar energy application.” he continued. If you’d like to read more about solar power installed at shopping centres, take a look at the Stockland Solar Power Rollout – which will see 12.3MW installed across 10 shopping centres in Australia. You can also read about Vicinity Centres’ solar project – which is the investment of $28m to install 11.2MW of solar power in five shopping centres. According to Smallcaps, ClearVue Technologies have also signed a a memorandum of understanding (MoU) with Grafsol General Trading for exclusive distribution rights in the United Arab Emirates (UAE), Kuwait, Bahrain and Qatar. “This MoU represents a great opportunity for ClearVue to break into the Middle Eastern region,” said Victor Rosenberg, executive chairman of ClearVue Technologies. We’ll report more about ClearVue in the middle east next week! Vicinity Centres To Install $75m of shopping centre solar. 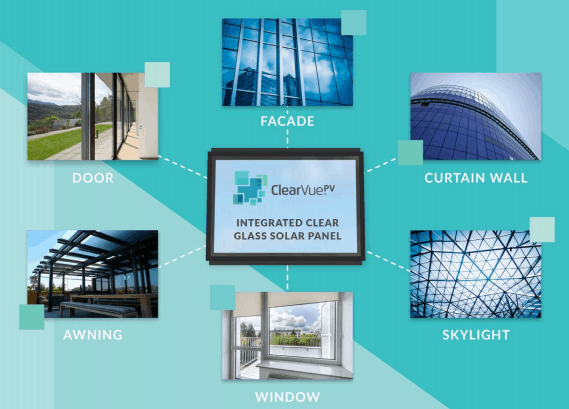 The ClearVue integrated clear glass solar panel. We’ve written about ClearVue solar glass a couple of times already this year – the Perth based company has had a successful IPO and has some great tech behind it. On Wednesday they announced the development of a frame-independent Insulated Glass Unit which will house the ClearVue integrated clear glass solar panel. A press release on the ClearVue website has given an indication of what we can expect from this company – they’ve developed these IGU’s which means there will be more licensing opportunities, as the clients ‘no longer need to rely upon ClearVue proprietary window frame designs and can instead utilise industry standard frames’ – meaning it’ll be far easier to get the tech into more homes, office buildings, boats, or even caravans. This represents a fairly significant shift in tech for the company who previously built the PV cells around the inside of the window frame – where it’s now captured within the IGU glass module itself – making it far easier to apply their BIPV integrated clear glass solar panel. The IGU units will be used in early trial sites in, amongst other places, Mirreco’s micro-homes. In other news, their window and glass curtain wall solutions continue to progress and are expected to be completed on schedule. We can’t wait to see what’s next for this and for solar windows! One of my favourite pieces of solar tech. The ClearVue solar glass IPO has been a success, with the Perth based company debuting on the ASX after raising $5m AUD via an IPO. They now plan to float on the national stock market in March, if everything goes to plan with regards to their solar windows. We’ve previously written about the ClearVue IPO – back in March they lodged with ASIC to offer 25 million shares at $0.20 to raise the $5m AUD (although RenewEconomy are reporting they were hoping to raise $6m). It’a fantastic to see them reach this amount and take the business to the next step. The patented ClearVue nano-technology was developed together with the Electron Science Research Institute (ESRI) at Edith Cowan University. Their BIPV (building-integrated photovoltaic) product generates a minimum of 30W per square metre of clear glass, whilst simultaneously insulating from heat and cold. They’re hoping to boost this 30W per square metre to 50W on the back of the upgraded funding. 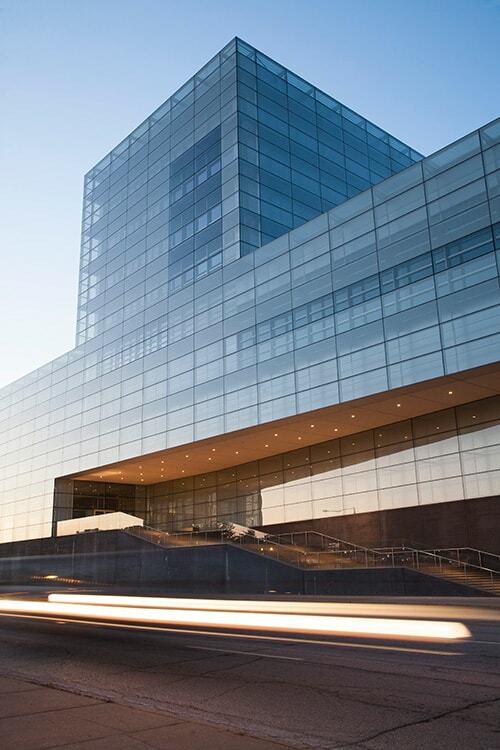 “Our technology presents a paradigm shift in the way glass will be used in building construction, automobiles, agriculture and speciality products,” Rosenberg said. You can see the ClearVue panels used in places like bus shelters where they power LED lights and a digital bus display. No doubt we’ll see commercial scale production of the solar glass next. This will be offered to the agricultural and greenhouse sectors, as well as in building and construction. In a world where it’s mandatory to have new solar panels on houses built in California, it’s certainly far from out of the picture to see solar glass installed in new buildings. If you’ve like to learn more, click here to watch a video on ClearVue from their website. Western Australian solar glass company ClearVue Technologies are preparing to float on the ASX – in order to raise capital to sell their solar power generating glass windows globally. They’ve developed the tech in conjunction with the Electron Science Research Institute (ESRI) at Edith Cowan University. According to an interview with Finance News Network, ClearVue’s executive chairman Victor Rosenberg said the company is currently in the pre-development stage and are hoping to commence manufacturing the windows within the next 8 weeks. They have a manufacturing partner in China called ROCKY Glass who will be making the windows to start, then they will licence the product worldwide, gaining income from both licensing and royalties. 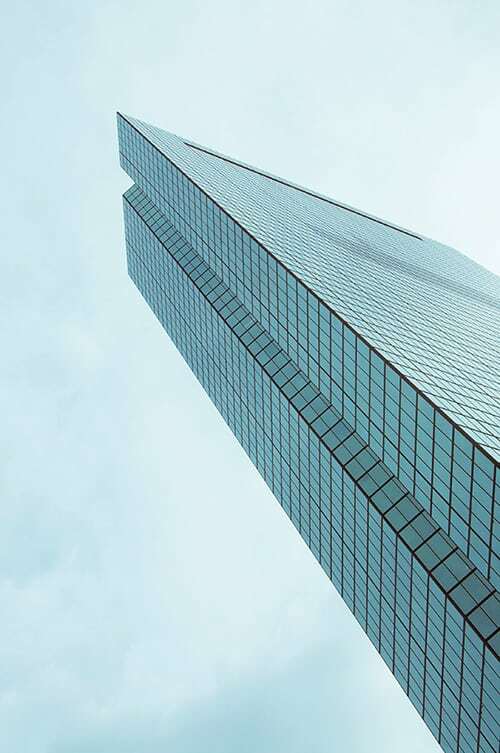 The ClearVue website have discussed their plans for the future: “Our technology presents a paradigm shift in the way glass will be used in building construction, automobiles, agriculture and speciality products”. ClearVue, founded in 1995, have lodged with ASIC to apply for 25,000,000 Shares at an issue price of $0.20 per Share to raise $5,000,000. Click here to download their prospectus and apply for shares online if you’re interested in their IPO. ClearVue Technologies’ current offering is a patented nano technology – using BIPV (Building-Integrated Photovoltaic). Unlike most of their competitors the window remains clear, and the solar glass also “allows the visible light to pass through up to 70 per cent and it rejects the infrared and the UV from penetrating the room”. “Nobody actually has got clear glass,” said Rosenberg in an interview last year. “They’ve got either lines or they’ve got dots, or looks like a chessboard with squares of solar panels on the glass. The windows currently generate 30W per square metre whilst simultaneously insulating and providing UV control. They’re hoping to reach 50W per square metre as they improve the BIPV technology. We’ve written quite extensively on solar windows – with technology such as perovskite solar cells and inkjet printed solar cells using Cyanobacteria among the more interesting ideas. There’s no doubt that this will be a huge market and there are quite a lot of competitors jostling to bring the best technology to market, so it’ll be exciting to see what happens!